Darrell has over 30 years of experience in the Central Georgia jewelry business. He began his career working for other jewelers as a bench jeweler, sales associate and was promoted to a store manager. He is extremely knowledgeable of all facets of the jewelry trade and holds several certificates in Diamonds from GIA. His creative skills compliment his ability to select unique pieces of jewelry for the store, as well as, turn the customer’s older jewelry into masterpieces. 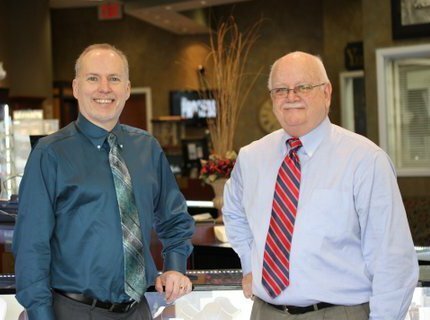 Recently, Yelverton Jewelers added Create Bar to their resource list of many skills and talents. Create Bar features a Computer Aided Design workstation that allows customers to design and visually see their favorite piece of jewelry with the aid of trained jeweler. Darrell, who previously was accustomed to manually designing jewelry, quickly mastered the complexity of computer-aided design and is now certified to use the Create Bar program to meet the customer’s needs. Wayne brings a tremendous set of financial skills to the business having held several executive-level positions with major aerospace companies throughout his financial career. He and his family have lived in the Warner Robins area for the past 20 years.